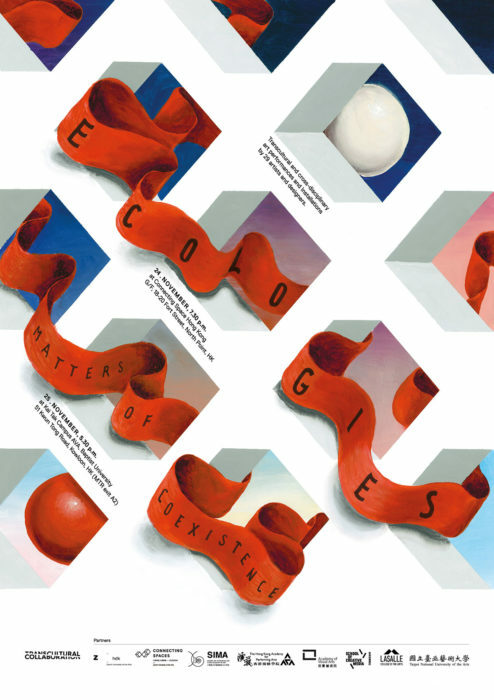 29 young artists and designers from Europa and (South-)East Asia will present their explorations and experiments on the far-reaching topic of “Ecologies – Matters of Coexistence” at Connecting Space in North Point on the 24th November and in the lush surroundings of the Academy of Visual Arts’ Kai Tak Campus on the 25th. This event is free of charge and open to public. – All events are free of charge and open to public. Kana Nishio and Boram Lee are on a journey of developing self-cognification. Hailing from Tokyo and South Korea respectively, the two artists experienced changes of self-identity in reacting to the new environment of Hong Kong. LAB9 V1.2 reflects upon the balance of forces and the interrelation between ecologies. This interactive installation invites the audience to step in and become part of a system. Through a personal approach driven by emotions, the work reflects the complexity of the individual in the system of society. It deals with the impossibility of total inclusion in the face of the need for structure and the necessity to coexist. The performance piece combines the disciplines of Classical guitar, dance and painting. Blending them into each other, it creates new relationships between and alternative emphases on these usually clearly defined subjects. Based on the topic of ecologies, the installation focuses on Kowloon Park as a social place and ecosystem defined by certain and distinctive parameters, a place that is coined by the dialectic of freedom and control. This site-specific sound installation explores how power and regulations operate in and through particular places, bodies, and social contexts. By looking at different situations and spaces the artists employ a variety of tactics, including soft, interpersonal tactics that rely on social pressure, and hard tactics that employ coercion and force. This exhibition expresses the different perspectives on loneliness, a feeling, which could be accepted or rejected, that one could feel forced into or could choose. While it is often evoked in solitude, it can also arise even when someone is amongst others. This installation raises questions on the future of work and the role that humans are going to play in an automated society. What will happen to us, if everybody has more time at free disposal? The works presented are the result of this years’ international graduate semester program “Transcultural Collaboration”, a cooperation of art universities from Hong Kong, Mainland China, Singapore, Taiwan and Europe that brings together an extensive range of disciplines and invites them to collectively think about transcultural topics. Its main working method is cross-disciplinary collaboration, including all art and design disciplines from music, to visual arts, to dance, to interaction design and everything in between. The program is mainly taking place in Hong Kong and includes stays in Zurich and Singapore.